Hi there! 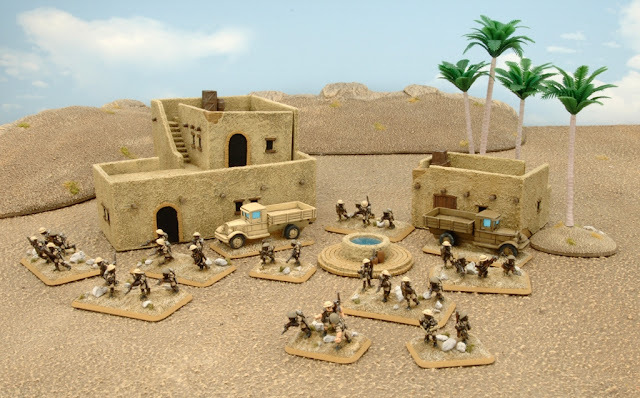 Just a very small post this week covering my SDF Rifle Platoon. This is one of the core platoons to a Sudan Rifle Company found on page 138 of Burning Empires. I've got one platoon done, and I'll probably cheat for a bit and mix it in with my 8th Army Rifles until I can get the remaining three platoons done. The SDF scouts out a village. I suppose I could talk a little on the terrain. The buildings are the standard BF desert buildings, which I have modified slightly by adding the roof poles. I've also repainted them to better match my desert terrain. The palms, table, and escarpments are all from the BF studio photography collection as I left all of mine at home on photo day! Yeah, that wonky second floor bugs me too. I hate it when you only notice such things after the photo has been taken! 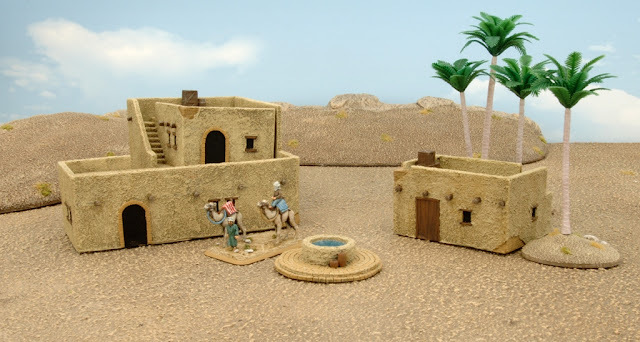 I've had all good intentions to do a Pimp your Desert Buildings article for the BF website, so hopefully I can tackle that soon! Can i assume the roof poles you're refering to our the joists that poke out of the wall? If so nice touch as my buildings are non-BF and would look better with there addition.